the Fraternity and Sorority P O L I T I C A L A C T I O N C O M M I T T E E ΑΒΓ Δ Ε Ζ Η Θ Ι Κ Λ Μ Ν Ξ Ο Π Ρ Σ Τ Υ Φ Χ Ψ Ω Fall 2017 Preserving the Greek experience for future generations of student leaders FSPAC Develops new Strategic Plan Fundraising, Governance Named Overarching Goals W ashington, D.C.! This new legislative cycle is proving to be full of news, drama, interest, and anticipation. There is much that is being discussed and reported about, and everyone is eagerly awaiting to see what will happen. As president of the Fraternity and Sorority Political Action Committee (FSPAC), I understand that our participation in this political process is gravely important. There are many matters being discussed that include issues the fraternity and sorority community have a tremendous interest in. Fraternities and sororities…we make the difference! Sound familiar from our last newsletter? I want you to know that we are being heard and making a difference in this process. As part of the Fraternal Government Relations Coalition (FRGC) and its other members: North American Interfraternity Conference (NIC), National Panhellenic Conference (NPC), and Fraternity Sorority Action Fund (FSAF), I am pleased that together we can make an impact on our many issues. The NIC and NPC have been effective in representing the interests and thoughts of their member organizations, while the FSPAC provides funding to candidates that believe and defend our fraternity and sorority issues. This is FSPAC's best-ever year for fundraising. By April's Capitol Hill visits, we had surpassed our all-time annual high revenue, with more than $330,000 raised in less than four months. To top it all off, we have continued the fundraising efforts throughout summer with leadership conferences and conventions. I am pleased to report that we have surpassed the $3 million lifetime funds raised for the FSPAC! It just happened to occur during this summer's Alpha Delta Pi convention, and on page 3, you will hear from one of their donors about how special that moment was for them. 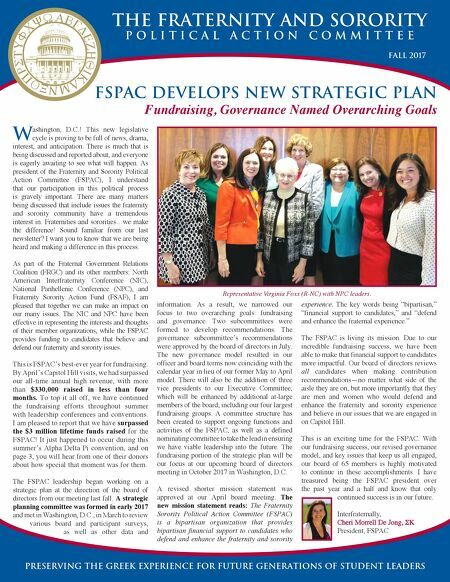 The FSPAC leadership began working on a strategic plan at the direction of the board of directors from our meeting last fall. A strategic planning committee was formed in early 2017 and met in Washington, D.C., in March to review various board and participant surveys, as well as other data and information. As a result, we narrowed our focus to two overarching goals: fundraising and governance. Two subcommittees were formed to develop recommendations. The governance subcommittee's recommendations were approved by the board of directors in July. The new governance model resulted in our officer and board terms now coinciding with the calendar year in lieu of our former May to April model. There will also be the addition of three vice presidents to our Executive Committee, which will be enhanced by additional at-large members of the board, including our four largest fundraising groups. A committee structure has been created to support ongoing functions and activities of the FSPAC, as well as a defined nominating committee to take the lead in ensuring we have viable leadership into the future. The fundraising portion of the strategic plan will be our focus at our upcoming board of directors meeting in October 2017 in Washington, D.C. A revised shorter mission statement was approved at our April board meeting. The new mission statement reads: The Fraternity Sorority Political Action Committee (FSPAC) is a bipartisan organization that provides bipartisan financial support to candidates who defend and enhance the fraternity and sorority experience. The key words being "bipartisan," "financial support to candidates," and "defend and enhance the fraternal experience." The FSPAC is living its mission. Due to our incredible fundraising success, we have been able to make that financial support to candidates more impactful. Our board of directors reviews all candidates when making contribution recommendations—no matter what side of the aisle they are on, but more importantly that they are men and women who would defend and enhance the fraternity and sorority experience and believe in our issues that we are engaged in on Capitol Hill. This is an exciting time for the FSPAC. With our fundraising success, our revised governance model, and key issues that keep us all engaged, our board of 65 members is highly motivated to continue in these accomplishments. I have treasured being the FSPAC president over the past year and a half and know that only continued success is in our future. Interfraternally, Cheri Morrell De Jong, ΣΚ President, FSPAC Representative Virginia Foxx (R-NC) with NPC leaders.